Bread no matter what kind of shape always makes you feel warm and comforting. The process is just as simple as mixing flour and water; you can make it any liquid you want to experiment with it. 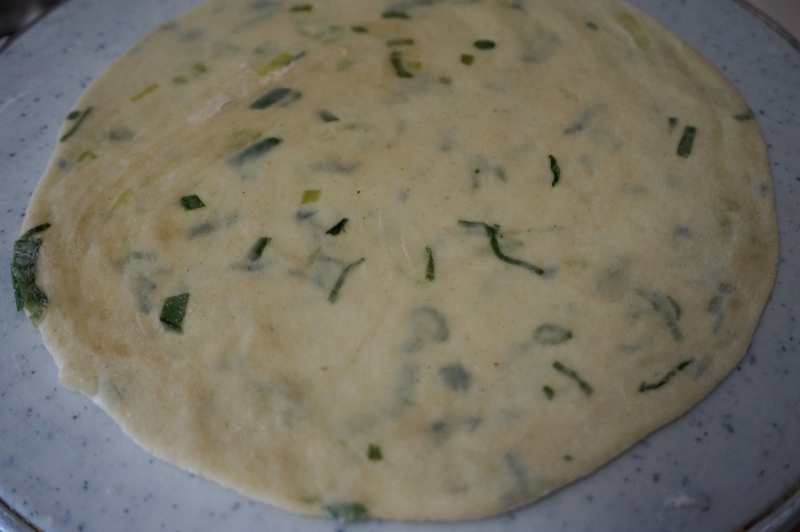 I decided to try the very simple scallion pancakes, going with the whole Asian theme here this week. You know commercial bread production began in Egypt in 3000 BCE, and the pyramid workers were paid in bread. 1928 is when pre-sliced bread was invented in America. Well now we have to work real hard to afford a loaf of bread. The choices are plenty, gluten free, fat free, calorie free, protein packed, flavorless ones. I will be posting a few more recipes of so called flat breads, which we Indians refer to as rotis, kulcha and parathas. Maybe it is psychological to me, but somehow bread from a bakery always tastes better to me. I like the whole process of slicing the bread; kind of makes you feel in charge about how thick you want the slice. I read around a few recipes, most of them had water added to the flour. I decided to do it with milk, like a bao bun recipe but flattened out and no yeast. You can feel free to experiment this with chicken stock or mushroom stock. I also added a cube of Maggie seasoning here for added flavor. Important to make sure scallions are washed and completely dried, and also to add enough salt to season the pancakes. Here is the recipe. Wash and dry scallions thoroughly, to make sure no sand is left. 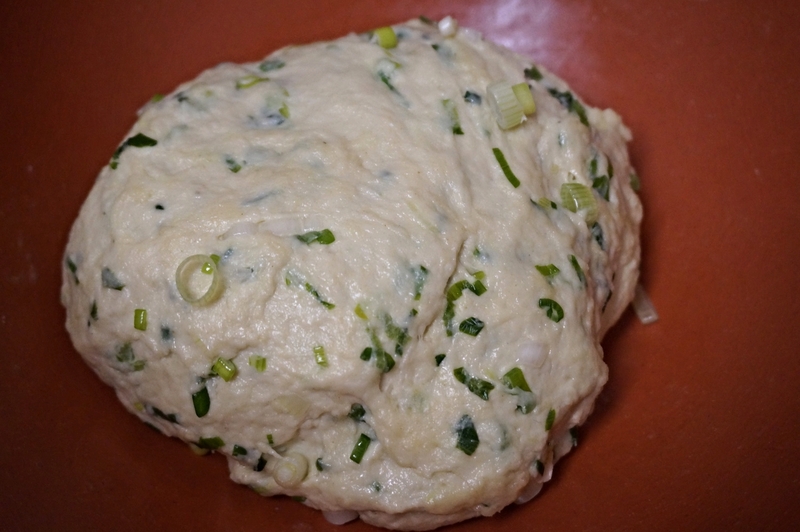 Scallions usually have water content to it, so what I would do is add them to the flour and let it sit for some time. This way later your dough won’t be too sticky. In the meantime warm up the milk with the butter. 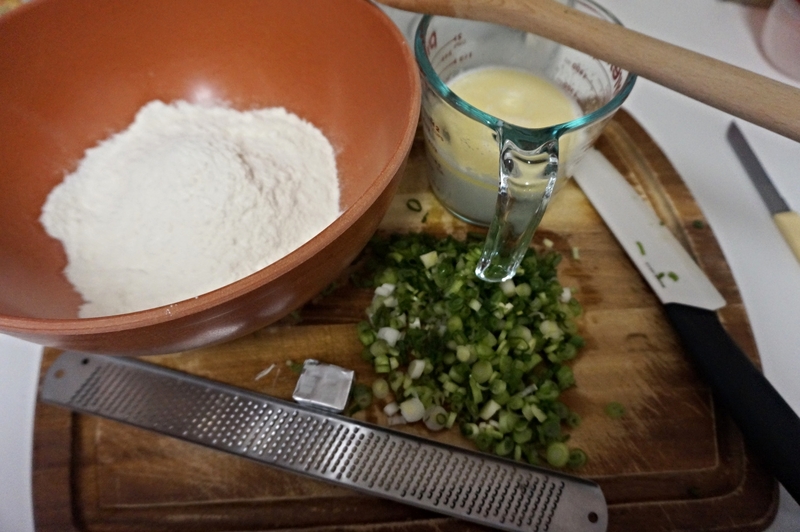 Add the seasoning, salt, and pepper to the flour and scallion mixture. Slowly add the milk and make dough, add a little at a time until you form a soft and smooth round. Let the dough rest for half hour to an hour. Take a little flour to dust the discs and start rolling. I tend to make more than I can eat always, so here I half cooked it in the pan without any added oil or butter. After they are completely cool, I stacked and froze them. They should last in the freezer for a month; I would try and use it up by then. To cook them to eat, just oil or butter one side and flip. Let it cook until you see darker spots on it. About a minute on each side and the dough doesn’t look raw anymore. Enjoy it with your favorite dipping sauce.